How things have changed! We had such fun in the babymobile and it was a great excuse to do things as a family in these early days (when honestly I’ve felt too tired to do anything – you always feel better once you’re out!). So thank you to Benfield Motors for giving me the opportunity to be a lifestyle test driver of the Hyundai i30, I loved it! Can you believe Reuben has a Great Great Grandma who is 105? 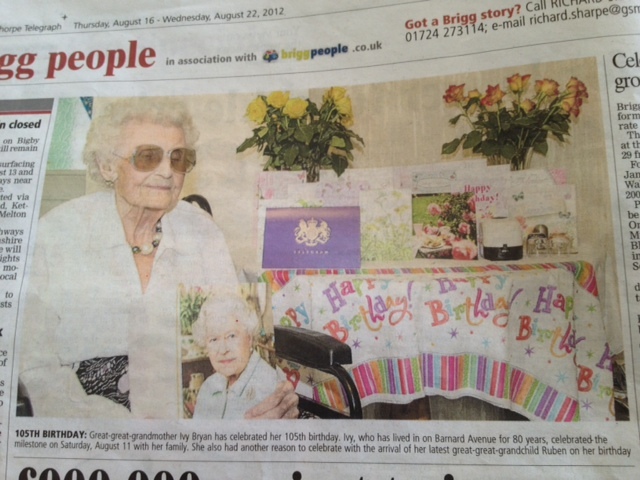 She turned 105 the day before Reuben was born so as a result he has already been mentioned in the newspaper! How amazing is that? 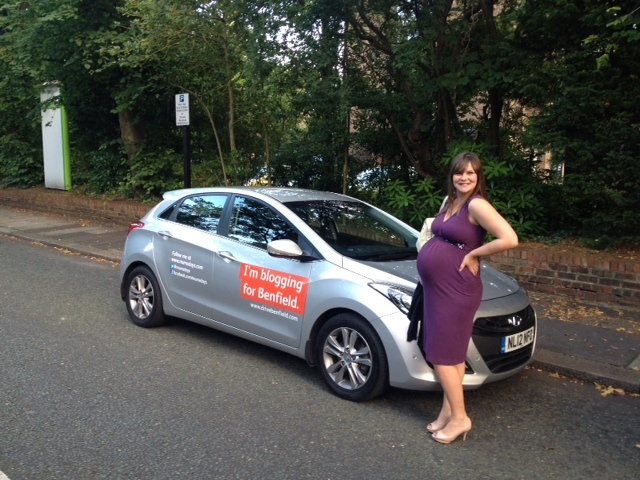 So, with the babymobile, we took the opportunity to go down to see everyone to show off Reuben and test drive the i30’s comfort and fuel economy while we were at it – 2 birds and all that. ROADTRIP!! 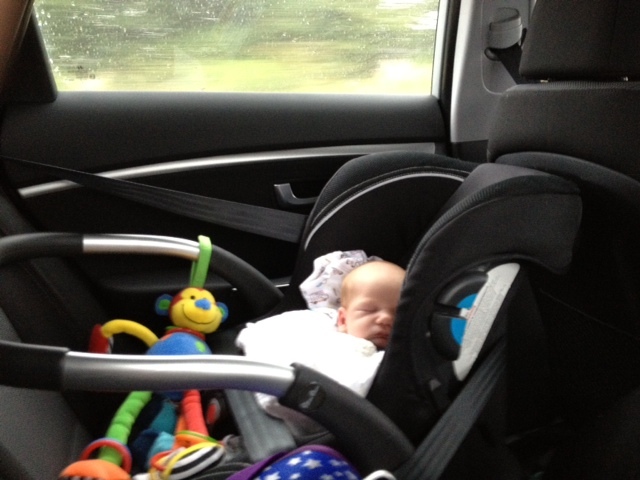 Firstly, the car is really very comfortable – I sat in the back with Reuben, so a) I could sleep (yum) and b) I could keep an eye on Reuben and attempt to soothe him should he wake. He didn’t though and slept like an angel there and back. Happy days! The other good news was that it cost almost half the amount in petrol it normally does for us to visit my Grandparents – I’ve told Mike this means I should be able to buy some shoes as we wouldn’t have saved that money unless I had this blog and Benfield had asked me to test drive… he’s not so sure! 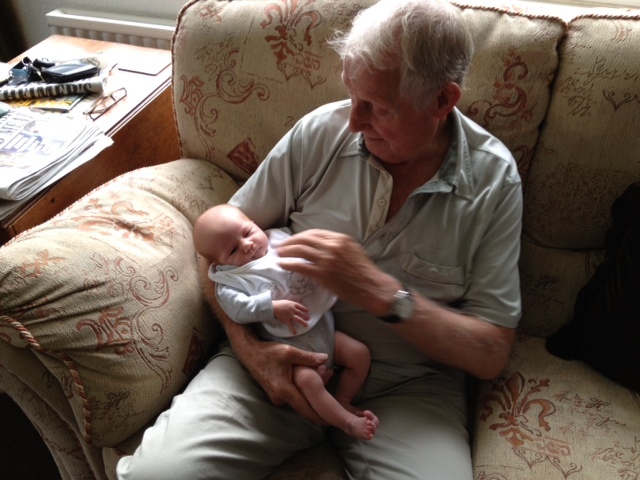 Secondly, it was lovely to see my Grandparents – they were made up with Reuben. Here’s my Grandad with him. And, here’s the money shot – 5 generations! 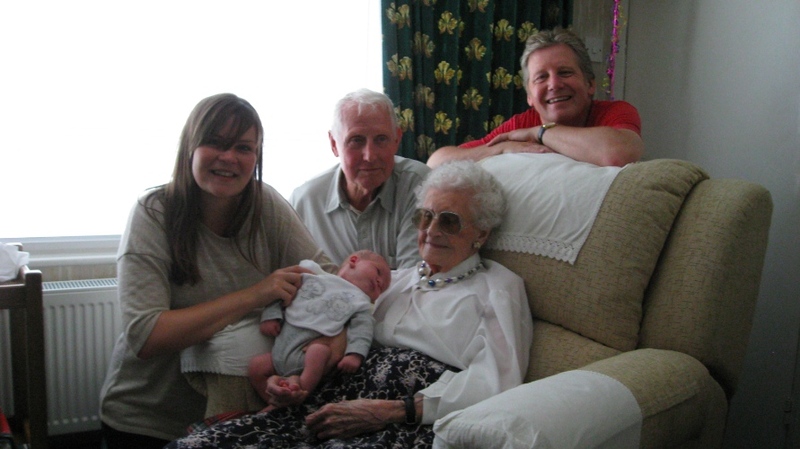 We have baby Reuben, me, my Dad, my Grandad and, of course, Nana. Unfortunately the lighting wasn’t great, and I can’t believe I left the house with my hair like that but you can’t win em all! Nana loved meeting Reuben – I think it’s so sweet how she’s holding his little foot in this picture. It’s hard to comprehend being 105 years old and Nana is amazing – she can hardly hear or see but she remembers everything and always seems to have a cheerful disposition. She also looks exactly the same as I remember her when I was a kid and she would come on holiday with us. It’s funny to think she was pretty old then at 85 and yet here she is 20 years later! I keep meaning to ask her what her secret is – maybe it’s ice cream as she was enjoying a small tub of Hibaldstow’s (where my grandparents live) famous Sargent’s Ice Cream when we first arrived!